5" foldout 1080 HD touchscreen for on-set monitoring and menu settings. Good riddance to the original Cinema Camera form factor. If this is true that would surely shake the whole industry, specially @ this price. Canon C300 Mark II for $16K that's a $13K price different. Wow looks like they really did it right. Seems like 4k 60p over SDI so they managed to avoid undercutting original URSA and surely that camera will get this sensor as an option. Besides resolution, I think that one of the best "feature" of the original Ursa is the way the camera handles colors, which is very nice and much easier to grade than Pocket Cam or a7s S-log2's footage... I hope that the Mini sensor will give similar colors too, it would be very helpful! On the specs it looks amazing stuff for incredible price. Killing all Canon, Sony and Panasonic competition. The new sensor looks quite expensive, considering the base model at 3K and the 4.6 model at 5k. that means almost double just for the sensor! But already loving it.. They use FPGA in most cameras, so I think it is many thing that are different, not sensor only. My only gripe (so far) is that they didn't follow the Red model of easily swappable lens mounts. In URSA sensor and mount are swappable as I remember. I don't think it's available in the mini. It's mentioned as being swappable on the Big Ursa and not mentioned on the mini page. You also can't swap the sensor in the mini. Will wait and see... but this might actually be the camera I've been waiting for BMD to make. Yes it looks insanely awesome. I was a little confused about the 1080p160 mode, is it a 1080 crop, or a full sensor read that is scaled to 1080? "Ultra HD windowing of the sensor enables 1080 HD footage to be captured at up to 160fps!" 4 mini models. I do not know if BD will derive sufficient profit gains to offset the added costs in supply chain and manufacturing complexities. Few companies do. Oh nice you got an arri amira!! 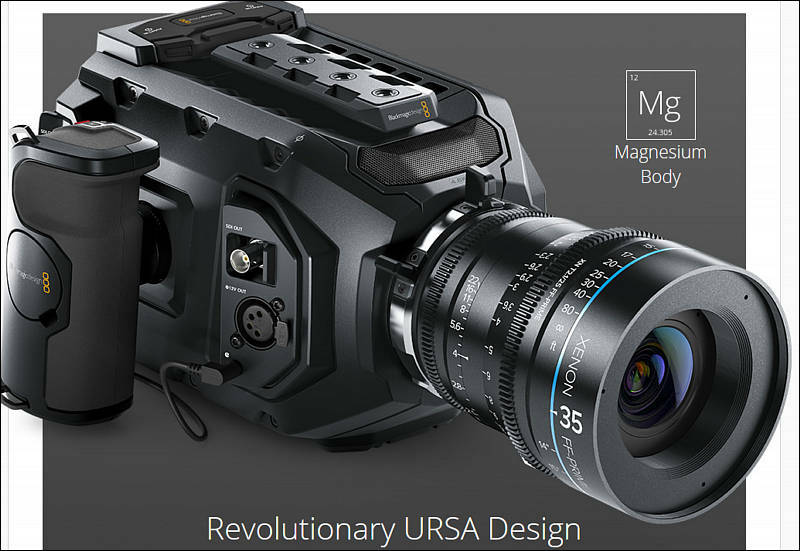 !, Ahh No its a....Ursa mini, Oh a uras mini whats that, Ahh its a 4.6k S35mm camera that shots raw and prores, up to 160 f.p.s, and it costs 5000 dollars, Oh wow where can I get one. Think amira was in BM scope, when designing this. 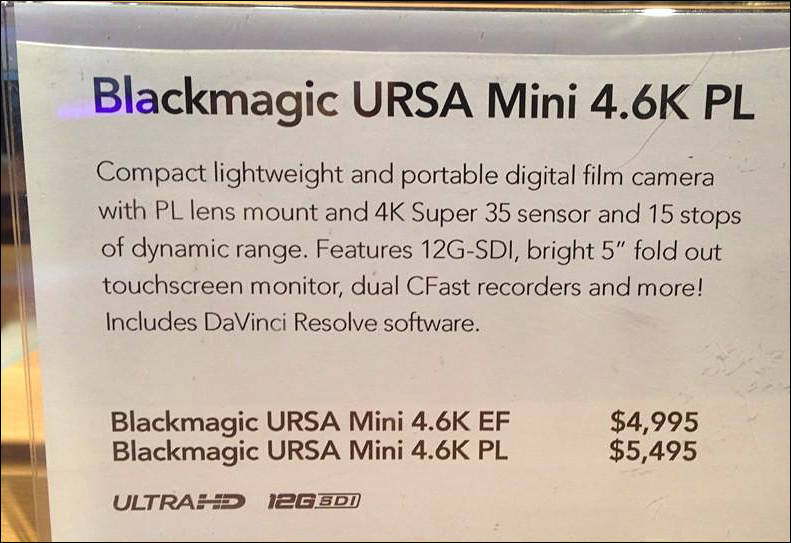 Wow... 15DR 4.6K 60fps RAW / ProRes all for $5K... all I'm going to say is BM is a phenominal company, they did it. The form factor the look, and the images out of it are spectacular. The other companies must be really nervous right about now.